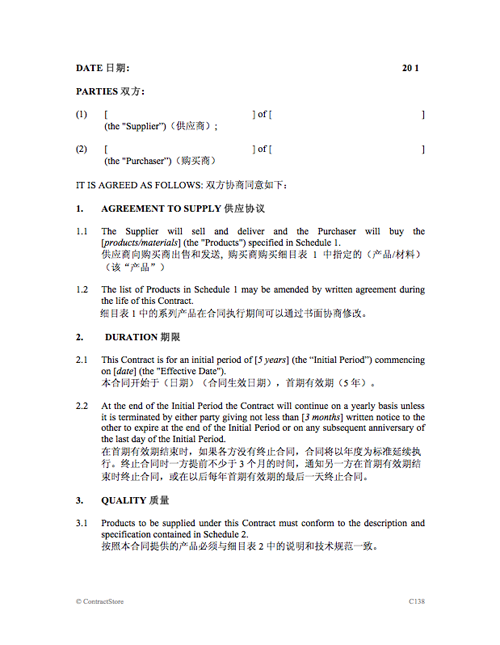 This document is in two versions – English and Chinese. 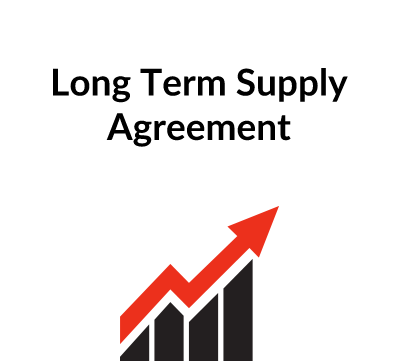 The supply agreement is for use where a supplier agrees to sell products or materials to a purchaser at pre-determined prices with minimum/maximum annual quantities, all sales being made against purchase orders. This is a fairly balanced agreement between supplier and purchaser with 11 clauses over 7 pages with a number of schedules. The clauses cover duration, quality of products, quantities and ordering procedures, delivery, risk and ownership, price and payment, termination and force majeure. This agreement can be used for manufactured products or raw materials. 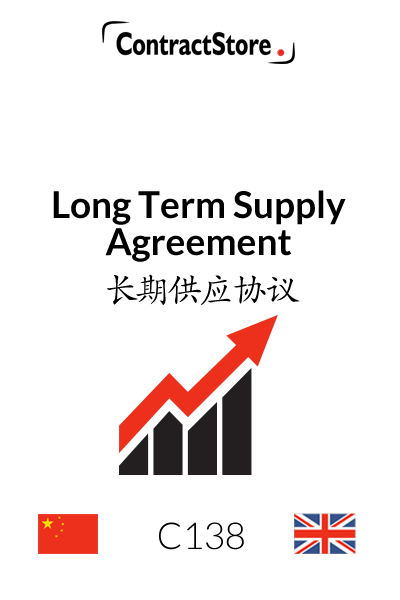 This is a general purpose agreement for a reasonably long period during which one party agrees to supply and the other to purchase annual quantities of products or materials. The agreement contains minimum and maximum annual quantities with provision for each sale to be made against a purchase order for a fixed quantity. 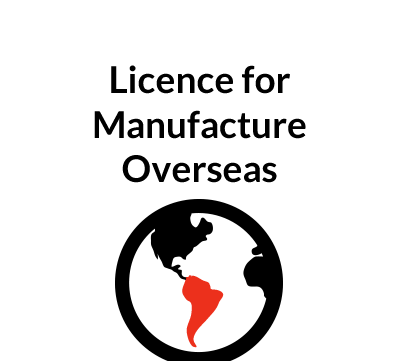 This agreement can be used for manufactured products or for raw materials, although in the case of some raw materials, where environmental considerations apply, detailed provisions and local legal advice will be needed. This establishes the basic agreement between the parties for the sale and purchase of Products which are defined in a Schedule. Those Products can be amended by agreement. Here the Initial Period and Commencement Date are to be specified. Clause 2.2 provides for renewal at the end of the Initial Period on a yearly basis. The quality of Products is, in effect, defined by reference to the specification which will be in a Schedule to the Agreement. The Purchaser must inform the Supplier if Products do not conform, in which case the Supplier is responsible for their replacement. (See also clause 8.1 “Claims and Indemnity”). There is also provision in 3.3 for independent routine and non-routine testing. Here again, there will be a Minimum and Maximum Quantity contained in a Schedule – in some cases only a Minimum or Maximum may be required. 4.2 requires the Purchaser to give regular forecasts of quantities, thereby enabling the Supplier to be in a reasonable position to meet purchase orders. 4.3 deals with the requirements for the placing of an Order, within minimum time periods and provision for delivery dates. 4.4 makes it clear that the Supplier is not required to deliver more than the Maximum Quantity. Sometimes an agreement such as this will contain “take or pay” provisions. In such a case, if the Purchaser fails to take the Minimum Quantity, he will pay for the shortfall. Similarly, if the Supplier fails to provide the Minimum Quantity, he may be penalised. We have not catered for this here but it is worth considering. In effect, a “take or pay” clause is similar to a liquidated damages provision. Careful drafting and specific legal advice will be required to ensure that such a provision is not declared an unenforceable “penalty. This specifies where deliveries are to be made and when they are to be made. Both ownership and risk in Product passes from the Supplier at the delivery point. 5.2 and 5.3 set out the two ways in which ownership and risk passes. The Supplier is responsible for packaging and the Purchaser is responsible for reimbursing the Supplier for any storage costs which are incurred as a result of failure to take delivery. Here the arrangements are that the prices at the commencement of the contract are shown in the Schedule. Whether or not transportation is included in the price, as stated in 6.1, is a matter to be determined contract by contact. Price adjustments in a long term contract are usually going to be necessary and we have assumed in 6.2 that there may be a formula for price adjustments. This could, for example, provide for a price adjustment each year by reference to the Retail Price Index published by the government in the Supplier’s country. 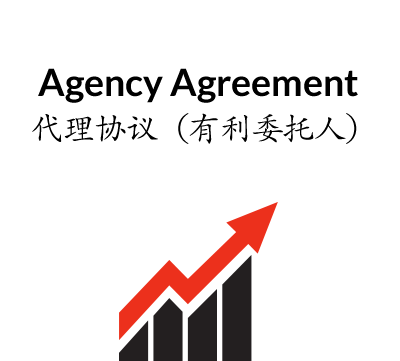 Alternatively, prices might be adjusted by reference to the Supplier’s price list or, if there is no formula, there could be a 3 month period of negotiation and if agreement cannot be reached, the Supplier has the right to terminate the contract (6.3). Here we have two alternative provisions at clause 7.1. Alternative A assumes payment on a monthly basis against invoices. Alternative B provides for the Purchaser to open a revolving Letter of Credit which will give the Supplier greater security, especially if Supplier and Purchaser are in difference countries. The Supplier is entitled to claim interest on late payment under 7.3. He is also allowed to suspend deliveries if payments are overdue for more than a specific period (7.4). At clause 8.1 the Purchaser agrees to advise the Supplier of any defective product liability claims and, at the Supplier’s expense, to assist the Supplier in defeating such claims. Clause 8.2 obliges the Purchaser to avoid making any misleading claims in respect of the Products. This allows the Supplier to terminate if the Purchaser is overdue in making payments and the Purchaser to terminate if the Supplier commits a material breach of the Agreement. Either party can terminate in the event of the other party’s insolvency. In a long term contract such as this, unforeseen circumstances could disrupt the supply arrangements. A force majeure clause such as this allows the contract to be suspended in such circumstances. If force majeure continues for more than a specified period, then either party can terminate – 9.2. This clause contains some short provisions restricting assignment, making it clear that this Agreement contains all the legally binding matters between the parties and deals with the services of notices.